Note: This program ended in 2013. The information provided on these pages is for reference and historical purposes only. greatly expanded implementation of geospatial services on the Internet. The program ended in 2013. But you can refer to this list of resources about other available funding opportunities. 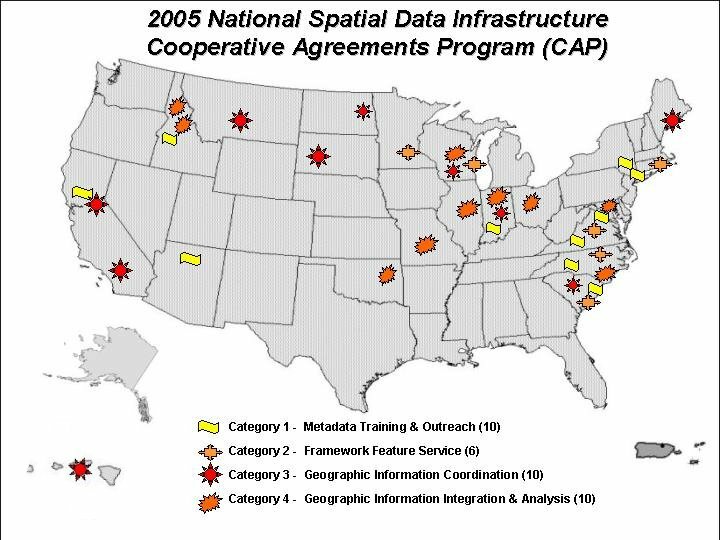 The FGDC is supporting international Global Spatial Data Infrastruture (GSDI) with its contribution to the GSDI Small Grants Program. The program has been available since 2003 and its goals are same as the NSDI CAP but the focus is on developing countries around the globe. Search for NSDI CAP projects - the Interactive Map Viewer allows you to search for projects by year, category, or State; includes projects from 1994 to present. For more information please contact Gita Urban-Mathieux, FGDC Grants Coordinator.